The Everpure OW2-Plus is designed to provide premium quality drinking water in office coffee service (OCS) applications as well as bottleless coolers and drinking fountains. Certifications. 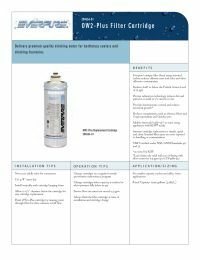 The Everpure OW2-Plus Filter Cartridge meets NSF/ANSI standards 42 and 53 for lead-free potable water. Contaminant Reduction. The Everpure OW2-Plus Filter Cartridge removes sediment and particulates as small as 1/2 a micron. This filter also reduces lead, cysts, chlorine, bad taste, and odor. KDF Media. The Everpure OW2-Plus Filter Cartridge uses KDF media which provides bacteria control and reduces scale build-up that can create clogs in your equipment. Additional Features. The Everpure OW2-Plus Filter Cartridge features a quick change system that makes filter changes quick and easy. This filter also requires the use of 1/2 GPM flow control with a Everpure head. The OW2-Plus does not require an electrical connection. The Everpure OW2PLUS is an alternate replacement filter for the Everpure ADC and S-54 cartridges but with the added feature of lead reduction.